Offer valid on purchase of one Evoz Smart Baby Monitor through Amazon. Enter your email address and we’ll send the offer code to you. We never sell or give away your email address. 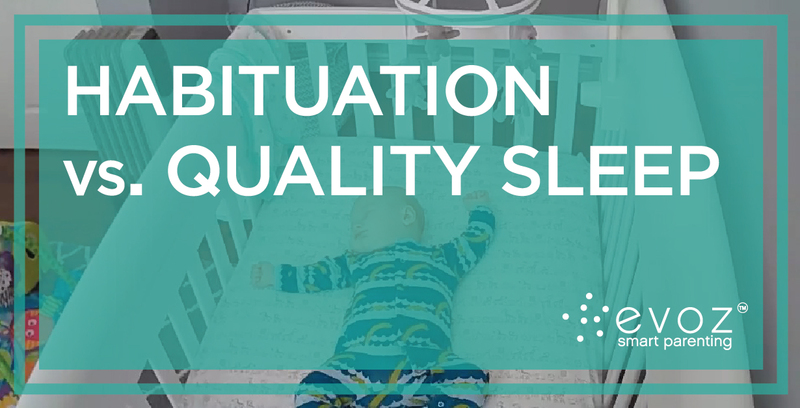 Habituation vs. Quality Sleep: Jessica and her adorable son sail through month two! Jessica Gleim, Evoz Director of Marketing, reports live from the second month of motherhood, where the word of the month is: habituation. Read on for more! Before my baby was born, friends, relatives and other moms told me: make sure your baby can sleep through anything. I wondered how he’d ever learn to sleep through our big, loyal, very loud dog. She takes her job of alerting us to every movement and noise very seriously! But I was pleasantly surprised: the baby didn’t seem to flinch when the dog would bark; and if he was napping, he seemed to sleep right through the noise. We’d take him on errands, to Target, the grocery store, on long car rides…and he’d just sleep through it all (even the LOUD car wash). I thought I was so lucky to have such a good sleeper! And then I learned about habituation. I’ve been taking an e-course called “Baby Sleep Solutions” from Evoz’s favorite sleep expert, Kim West LCSW-C, The Sleep Lady®. At the very beginning of the course, I learned about the different types of sleep that babies experience. Active sleep, deep sleep…I’d heard of those. But then I read about a type of sleep I’d never come across — “habituation.” The jist of it is, when your baby is surrounded by noises and stimulation, they may look they’re sleeping, but they aren’t. They’re working hard to block out all of the sounds buzzing around them. And it’s actually exhausting. Babies who are habituating instead of having a nice, quiet rest usually “wake up” grouchy and fussy. There isn’t anything wrong with habituating – it’s a normal part of baby’s development. But it isn’t the same as getting restful sleep, which babies need a lot of. So my friends were misguided: instead of trying to “train my baby to sleep through anything” by forcing him into my life of errands and events, I needed to protect his sleep time and make sure he always had a quiet, dark space to get the good naps that he needed. So I’ve changed my ways. But thanks to my Evoz Smart Baby Monitor, this didn’t cramp my style much. I’ve found that the monitor is super easy to travel with: I just set it up once on each WiFi network, and it remembers the network name and password after that. So if, for example, we aren’t home around 6:30 pm for his early-evening nap, I just set up the Evoz monitor in a quiet, dark place at my parents’ (or in-laws’ or friends’) house and we can keep an eye on him while still enjoying dinner. Totally stress free! The other thing I learned from Kim’s course is that good napping leads to good nighttime sleeping. It’s a little counterintuitive: you would think that a baby who had a terrible nap day would be so exhausted, he’d sleep through the night! Nope. Complete opposite. When baby napped, I used to put him in his swing in the living room, or in his rock ‘n’ play next to my computer– now I know that the best place for him to nap in his crib, alone, with his sound machine on (to block out that barking dog of course!). And here again, our Evoz Monitor is the eyes and ears of the nursery. I can check in on him on my phone any time, but I also have the app set to text me if he cries for more than three minutes. That way, even if I’m not streaming the camera on my phone, or not paying complete attention, the phone will alert me when he needs me. It’s like having a tiny, silent babysitter. 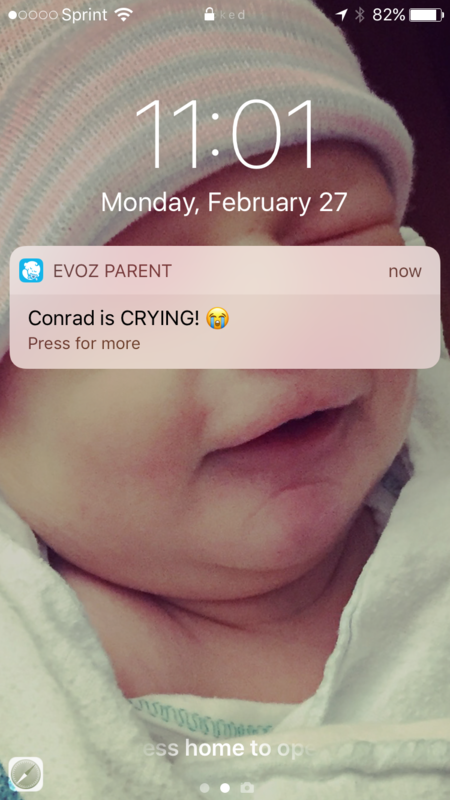 Evoz baby monitor cry detection alerts. I can say with 100% certainty that learning about habituation and good napping has saved my own sleep! Our best nap days have definitely led to nights with the longest stretches of sleep, and since I’ve been paying more attention to his daytime naps, he’s been able to get consistent good stretches at night. Of course, we’ll have to see what month 3 has to offer us. Until next month, sleep well! Disclosure: This blog post contains contextual affiliate links. Evo Inc. may get commissions for purchases made through links in this post.